1. If you really want to get better at dressage, take it up at an earlier age - and grow an extra 3 inches of leg. 2. 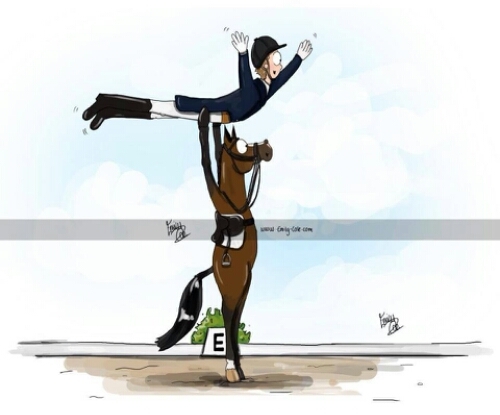 A dressage test is a test of your skill against another competitor's luck. 3. Dressage is about achieving a harmonious working relationship with your horse, whose only idea of harmony is eating grass in a field with his buddies. 4. If you want to end a drought or dry spell, wear a new jacket and hat to an outdoor arena. 5. Untalented, difficult, aggressive horses have robust health, good hocks and long lives. 6. Talented tractable horses are accident prone and have OCD lesions. 7. You will ride the best test of your entire life just prior to being disqualified for not wearing your gloves. 8. Never keep more than 300 separate thoughts in your head before a test. 9. Never keep less than another 300 separate thoughts in your head during a test. 10. Horses do not improve their paces because you are wearing expensive German breeches. 11. If you chose a disco theme for your dressage to music test then the judge will be more than 90 years of age and Swiss. 12. The less skilled the rider, the more likely they are to share their critique of your test. 13. If you are considering the services of a horse clairvoyant to help you with training then you have reached the point of total desperation - try the German breeches. 14.Your horse has never heard of Podhajsky, let alone read the book. 15. No matter how badly you ride a test, it is always possible to ride a worse one. 16. If it ain't broke, try shifting your position and it will be. 17. Judges only suffer from temporary blindness (or kindness) when they are judging someone else's test. 18. If you fall off your horse in the arena you will have paid to have the test videoed. 19. 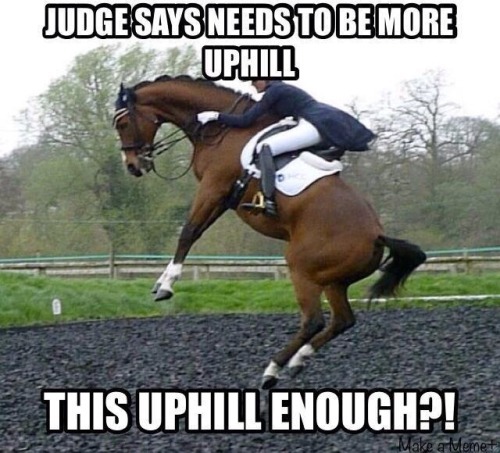 If you are feeling confident before a show then three of the USET dressage team will turn up to give their young horses some "experience." 20. 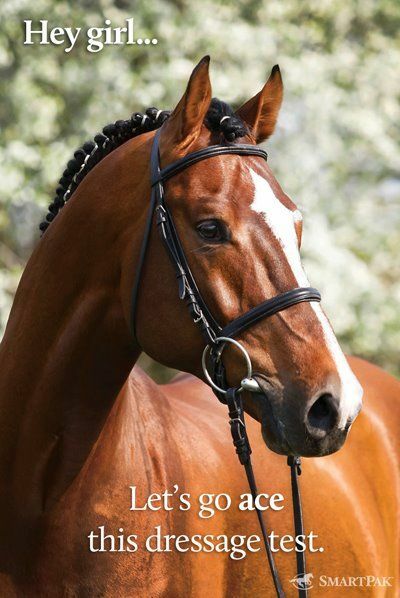 Your horse will perform its best piaffe ever when you ask for extended canter. 22. Since runs of bad competitions come in groups of three, the fourth competition is actually the beginning of the next group of three. 23. 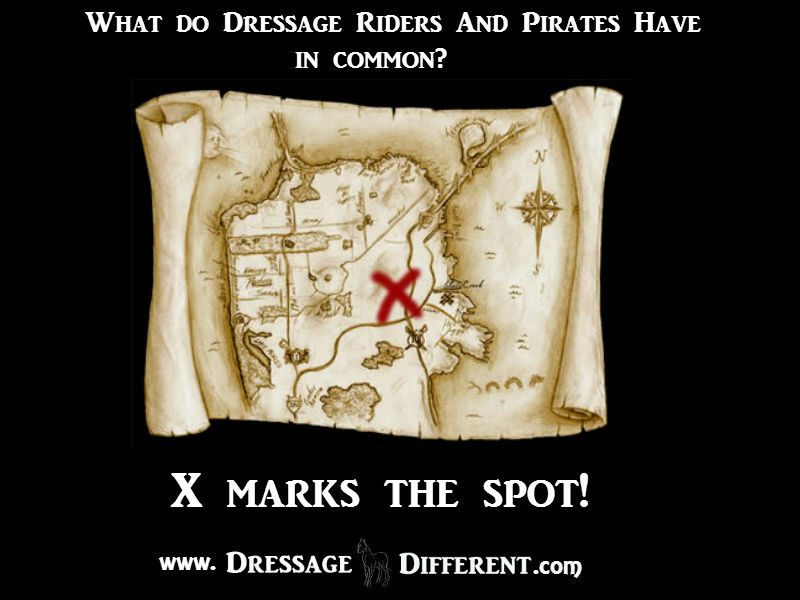 No one cheats at dressage because no one has worked out how to do it. 24. It is surprisingly easy to end a test with a perfect square halt once you have scored a four for every other movement. 25. The result of an expensive lesson from a top pro is that you will stop believing in that tiny piece of innate ability that was holding your riding together. 26. Remember when buying a dressage horse advertised as "needs experienced competitive rider" this really means "needs the skills of Isabelle Werth just to stay on board." 27. If you think your test was better than someone else's, it probably wasn't. 28. If you pay 60,000 for an imported WB, you will be beaten in First Level 4 by a Quarter Horse. 29. Clinics given by someone with an interesting accent are not necessarily superior to those given by the homegirl. 30. If you go to the expense of raising an expensive WB foal, he will have a talent for jumping and no walk worth talking about.